Cyclesnack: Real men have rigid forks! The Crazy Eddie of Framingham does it again! I wonder if this marketing technique is effective. Basically cajoling people to buy his products. If anything, it's definitely amusing. Hey you rough, tough mountain dudes ! I see you at Lynn Woods and Viet Nam with your full-suspension, 27-speed wussie bikes. Stop being a girly, sugar-assed puffball.! Try one of these brand-new, steel, single-speed 29ers, - no suspension, no gears; - pure minimalism. These are 40% off list price. I have sizes 17 and 19 in 26 inch single-speeed for $260, - sizes 19 and 21 in single speed 29ers for $280, - sizes 15, 17, 19, in 8-speed 29er for $335 – size 17 in aluminum 29er with discs for $360. Us single-speed mountain guys are so tough, when we go to the bathroom – crowbars come out ! Real men have rigid forks ! 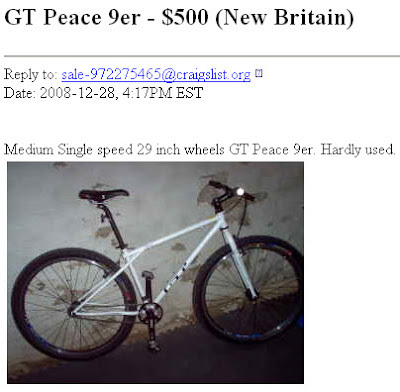 I wonder in if this is the same GT Peace 29er that I found on Craigslist earlier this year? Again, this could be a pretty good deal if you could get for $300 or $400. Based on Eddie's prices, you could do a day long road trip consisting of buying a new bike (because that is always fun), hitting a brew pub, and going riding. Probably a 3 hour round trip drive, hit Eddie's shop, do lunch at Post Road Brewing Company and sneak in a ride at Lynn Woods on the way home would be a great Master Card commercial. And here is another 29er in CT up for grabs! Aesthetically, I am not sure I dig the green Chris King headset on purple bike. If the guy is ready for a new one he either realizes he is indeed a puff ball and can't stand riding rigid or he's got so many miles on this bike that it's about to fall apart. Size and miles are the two questions you might want to ask this seller. 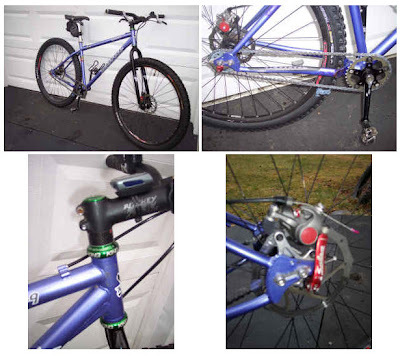 Might be a good deal but if you are interested in this bike but don't discount Crazy Eddie, his prices are INSANE. If I get another 29er, it will definitely have gears and it will be rigid. In fact, I would probably use it to replace the 'Goose.